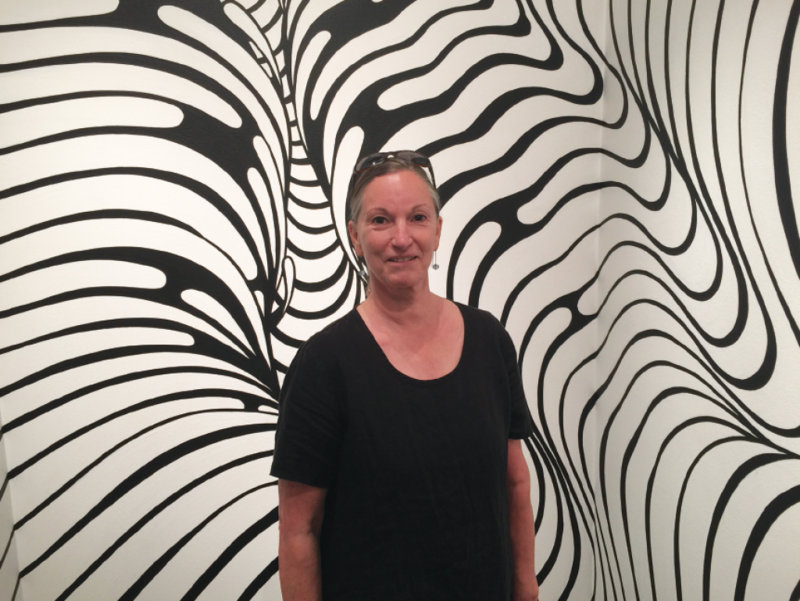 Introducing Alissa Arp, a local upholsterer, world traveler and Southern Oregon University (SOU) Environmental Science professor. 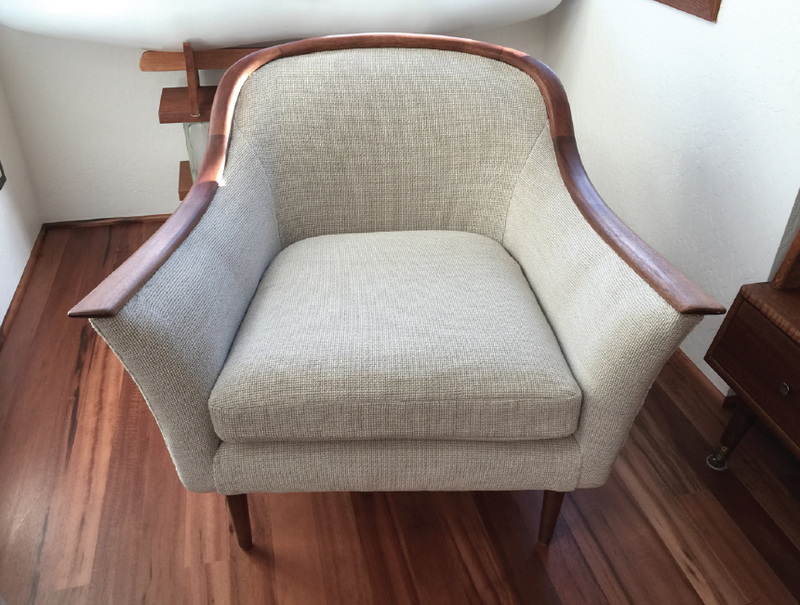 Based in Ashland Oregon, Alissa has a passion for finding and restoring vintage furniture pieces with a special focus on the clean lines and high quality of the Mid Century Modern period. 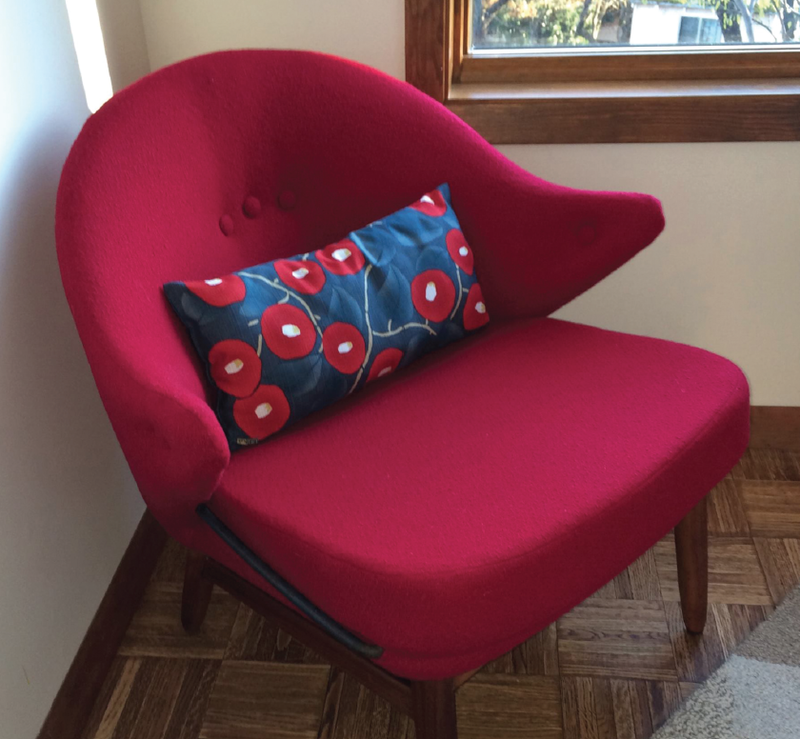 She is passionate about studying and collecting period pieces from designers ranging from Eames to Saarinen, and Frances Knoll to Hans Wegner. Alissa then refurbishes and sells these pieces to enthusiastic collectors as well as in specialty vintage stores such as Rose City Modern in Portland, Oregon. 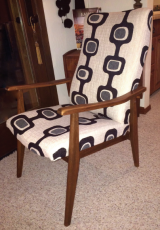 Arp Upholstery offers custom refurbishment and upholstery services for individuals wanting to restore, renew and maintain the quality of their furniture pieces. Upholstery work when done right brings long lasting value, revitalizes your home, and enhances style and elegance through functional design. Hi Alissa, thanks so much for speaking with us today. 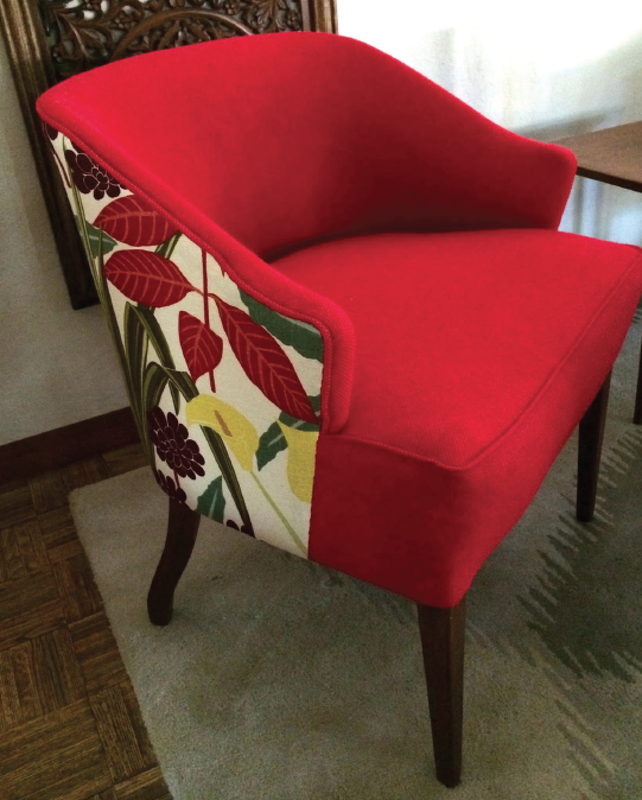 To begin with, please tell us how you first became interested in upholstery work and a bit of your background. I ventured into furniture rather naturally from my interest in other aspects of design and craftsmanship. I am an avid DIYer and recycle through my home regularly updating both the room design and layout, décor, functional items and furniture. I am constantly trying out new colors, textures and combinations. My life time goal would be to create or re-create every single item in my home! I am drawn to minimalist and clean design, and have recently been trying desperately to rid my home of plastic and other non-sustainable materials, as well as reduce waste as much as possible. This is where “upcycling” quality furniture comes into play. Why buy new when better pieces already have been crafted and can be revitalized into much higher quality and more aesthetically appealing custom designed pieces? After having refurbished practically every piece in my home several times over, I began working on other peoples’ furniture about 5 years ago professionally. My business arose from my desire to get my hands on, and re-do, as many challenging and interesting pieces as possible. 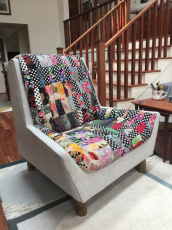 I think I have re-upholstered and renovated over 75 plus chairs, sofas, stools and eclectic items such as tiny homes fold out sofa cushions and a custom saxophone case cover. Although I love to work on Mid Century pieces from the 50s and 60s, I do take on a range of pieces from vintage Victorian to American Craftsman and more. I will consider any piece if it is of high quality and is meaningful to the owner. Some are done in whimsical styles with mismatched fabric or bright and cheerful prints, and others are classic and elegant pieces that can anchor a room. How have you gone about learning how to take things apart and then put thing back together again? It’s a bit like a giant puzzle. Anything that was put together can be taken apart, refurbished, and put back together – it’s fun, but a lot of work and some heavy lifting. 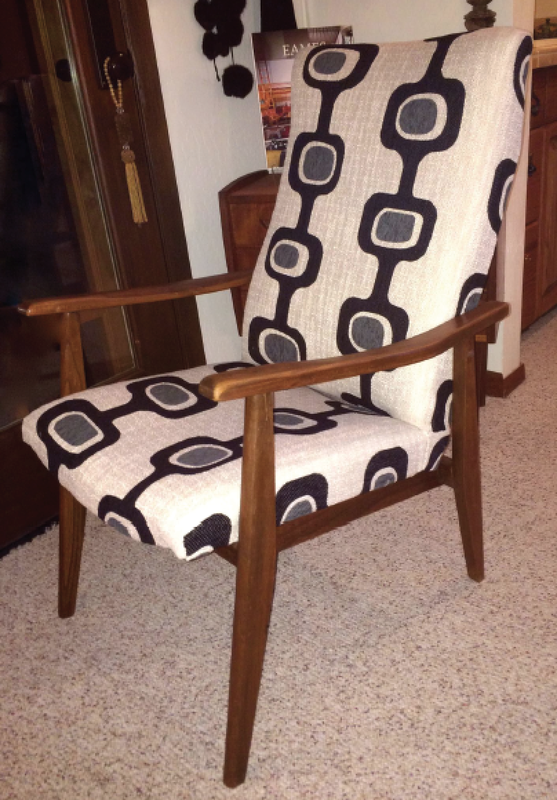 I started by simply taking apart one of my favorite chairs that I inherited from my parents. I can sew like the breeze with any material, so that of course helped in the learning and confidence area a lot. I also have worked with my hands all my life, from clay to weaving, knitting, clothes construction and more. The secret is practice and finding access to quality supplies – especially fabrics. I imagine that your job must be very complex at times as there are no instructions, manuals or guides. Yes, but if you take it step by step and study the project thoroughly all the way along it is very gratifying. I have a passion for uncovering, understanding and solving problems, perhaps related to my training as a scientist. In environmental biology we are always looking at solving the problems associated with ecosystem interconnections and sustainability. I like the balance this works provides for me because it takes me out of my head and into my hands, where I am actually solving problems and creating beauty rather than just studying it or observing. Alissa, can you please describe the pieces that you take a particular interest in and why? I do like the styles from the Mid Century Modern period. The focus on geometric design, rich colors, clean lines and minimalist shapes just speak to me. The use of warm, lightly finished solid wood in combination with the fabrics of the period are so appealing. If you think about the legs of a chair for instance, MCM chairs have simple tapered legs that do not overwhelm the piece, as opposed to a chunkier style like craftsman, or a traditional chair where there is a skirt of fabric all the way to the floor. I think MCM design suits our global movement toward simplicity and minimalism as we unravel and address our impact on the earth. This is another reason I am passionate about repurposing furniture, it is basic recycling while creating beauty with a purpose. Can you tell us more about the range of pieces that you are working with? Recently I have been working on a Mitchell and Gold sectional sofa, an extensive set of cushions for a bay window, and matching wicker chairs and sofa. I recently completed a lovely simple side chair that is very elegant and, my clients told me, comfortable and used daily. 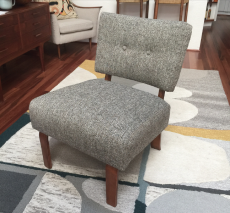 One of my favorite recent projects was reupholstering a pair of Harry Bertola chairs and an ottoman in a gorgeous teal colored Knoll Textiles fabric called Aegean Hourglass, which is a fabric recreated from the appropriate time period and style. Alissa, how are you working with customers to determine if a piece is actually worth taking on and restoring? I will take on any piece as long as I feel it is of quality and of interest to me. I am always seeking a challenge but I do enjoy a simple seat cushion replacement job as well. It can make a huge difference in a room, and I like that outcome in and of itself. While I love giving new life to a well-worn piece, I help the client evaluate if a piece is worth reupholstering or restoring. Solid construction and craftsmanship, maker provenance, as well as general design lines all play a part in the decision as to whether or not something will be worth restoring. Often times customers may not realize how costly and time consuming a restoration can be. Occasionally you have even helped an individual to come to the conclusion that the item that they want to restore is simply not worth the investment. This actually occurs more often than you would think. And I like being of help to someone weighing their options. 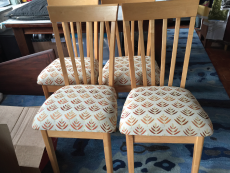 Reupholstering a piece correctly – that is taking it all apart, removing old fabric – and if needed cushions and interior stuffing, cleaning and tightening joints, etc. can be a very labor intensive task – and therefore costly and time consuming. I usually try and guide clients through the process of determining the quality of the piece, whether they have a strong sentimental attachment to it, and/or how much they just simply love it. Usually people that have an original designer piece will know the inherent value, but not always, and that is fun. Please tell us about your process of choosing a project. First I ask for a photo, and then judge the complexity of the project and the labor involved. Then I respond with an estimate of the cost of the project via email. I prioritize projects that I know will be significant, elegant and one of a kind. One of the first questions I ask is whether the client has pets – that is always a significant factor when choosing fabric. I then want to know how the piece will fit into to where it will live. Is it an anchor piece like a sectional sofa that dominates the room, or a blended piece, or – the most fun – showcase piece that provides a focus in a room? Then it is more about a person’s style, uses and wishes. Do you want something soft and luxurious or do you want something textured? If it is a period piece (MCM, Louis XVI, Craftsman), do you want the fabric to be similarly accurate to the period, or do you prefer a more eclectic look? How will you use the piece – every day or more for accent and style? Some people know exactly what they want, and some are unsure, undecided or not confident enough in their tastes to choose on their own. I can help. Finding and choosing fabrics is something you are often helping your clients with. Please say more. I have many bolts of fabric around my shop that I have collected over time. I have my favorite suppliers – Knoll Textiles, Maharam and a few others. I have drawers full of their samples. I use these companies because they are authentic and period specific. Their fabrics are extremely high quality and I know from experience that I can rely on them. Simply visiting local fabric stores is not advisable, most do not carry true upholstery grade fabrics. Choice of fabric – both quality, texture and color is hugely important in ending up with a stunning piece, however subtle or splashy, that will last for decades. What have been some of your most exciting and complex projects you have done? One of my favorite projects was a suite of mid century modern chairs for the foyer in the Music building at SOU. All told I think there are 12 chairs in 3 connected banks. They were in terrible shape and ripping them down to their foam base was a bear of a job. 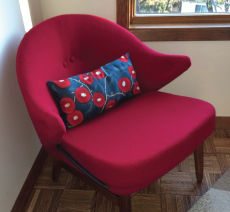 The Director of the Oregon Center for the Arts at SOU, David Humphrey, choose a fantastic bluish-purple wool fabric called Hallingdal from Maharam, and is perfectly matched with the style of the chairs and is authentic to the time period. The end results are stunning – attend a concert and see! Alissa, please describe what your customers are usually looking for when hiring you to do a restoration. I find local clients to be very easy to work with – they are appreciative of my time, skill and experience. Of course they want a quality job. Often, they get referred to me by past customers or they visit my website for examples of my work. Finally they come into my workshop which is connected to my house and they can see many pieces that I have redone and that I live with in my own home. 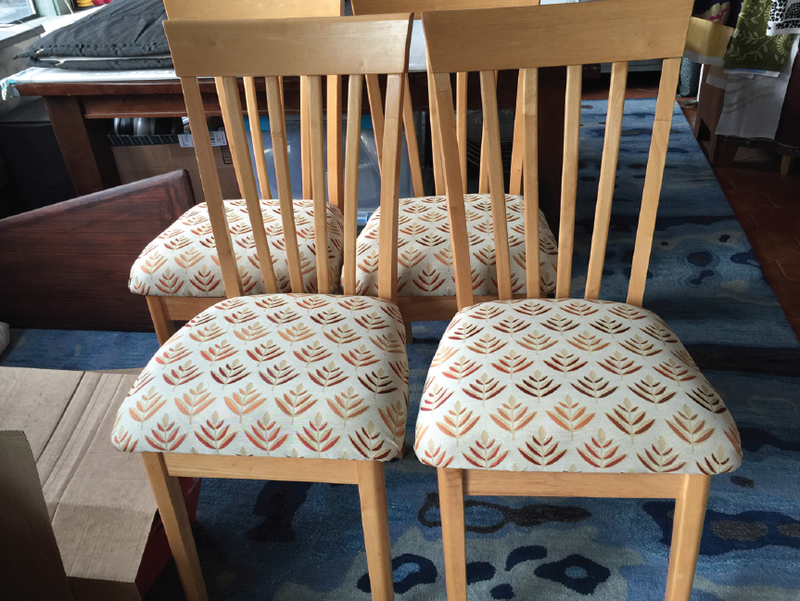 Price is important to my clients, but I find having the job done right is the priority as reupholstering a piece is a sizable investment of money as well as a commitment they will be living with for years to come. They are often choosing to redo a piece for sentimental value as much as an investment. We work closely together to achieve the style, functionality and appeal they desire. My customers want an expert to do the job right. They want to feel confident in the outcome, and things have gone very well – people seem as genuinely pleased with the final piece as I am – it is a rewarding process. What is an average time frame to complete a project? Rather quickly as I won’t take a piece on until I am ready to concentrate on it, and I usually will only take on one project at a time. My customers are surprised at the turn-around time. The typical hold up is usually selecting and getting delivery of the fabric. I do have some fabrics in stock and then it can be very fast. I’d say the completion time ranges from days to weeks depending on complexity, but no longer, and I’ve never had a project go more than 3 weeks. Alissa many of our readers may also know you as an SOU professor and world traveler. Please say more. I teach environmental science and biology. I was trained and worked as a marine biologist for the first decades of my career, and have been at SOU for 8 years now. I have been on a mission lately to travel to remote and important ecosystems to inform my teaching – recently I’ve been to Antarctica, the Arctic, Borneo, the Amazon and Galapagos Islands – and I just returned from a trip to Africa. Of course while traveling I am always watching for great textiles, artisan crafts and just observing color and textures. An example from my recent safari would be the colors expressed by the large migratory animals – the big cats and their camouflage coloration (a lion in the tall grass is hard to see), or the showy and flashy animals like giraffes and zebras, or the wide variety of colorful and highly adorned birds, such as the Grey Crowned Crane – the national bird of Uganda. And with design in your home, you can blend and create a seamless clean feel, or have a stand out, stunning, piece that draws the eyes in immediately – like an exquisite bird standing on the savannah of the Serengeti. Your work as a scientist and educator involves environmental stewardship. Is there a connection with your business? Absolutely, as I mentioned above, recycling quality furniture just makes sense in today’s world, and creating beauty combined with functionality is a great outcome. You’re not just recycling, you’re enhancing and “paying it forward”. Alissa, can you please provide us with a full overview of the services you provide? Furniture re-upholstery, which includes: fabric replacement, foam and filling replacement, cleaning and small repairs to the wooden structure and re-stabilization and strengthening of joints and legs. Cushion recovering and construction, as well as, other unique projects such as the saxophone case I mentioned – I like a creative challenge. I have access to quality fabrics, foam, fillings, and in some cases springs and webbing, as well as hypoallergenic materials. Experience has allowed me to develop quite a network of suppliers, as quality supplies are difficult to come by here in the Rogue Valley. How are you working with pricing? Each piece or project is one of a kind, so it is difficult to state definitively. Costs can range from several hundred dollars for a simple set of dining room chairs to over a thousand for a large sofa or a particularly complex chair. 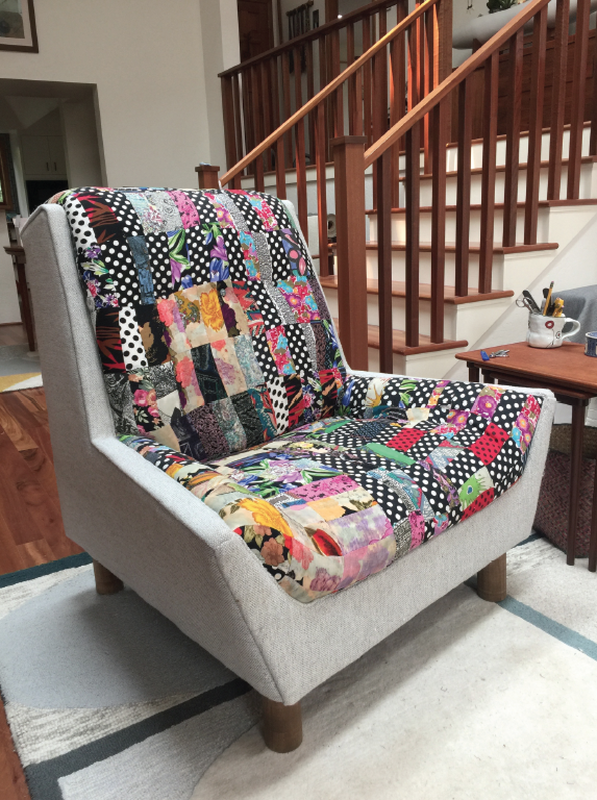 I do take on simple cushion construction from time to time, but I find the time involved in coordinating the project and fabric does not really make it cost effective to recover single cushions or other very simple jobs. Finally Alissa are you currently taking on new projects and what is the best way a potential client to reach you? I am currently taking on projects and devoting full time to my business. I have not scheduled another expedition type adventure until next fall when I travel to Papua New Guinea. The best way to reach me is to simply email me with a description and snapshot of your piece or project. Then when we talk by telephone it is easier for me to answer questions. Phone calls are welcome too of course. I do respond quickly to inquiries by telephone or email.